TERRORISM: How to Talk to Your Students, Say This, Do Not Say . . . 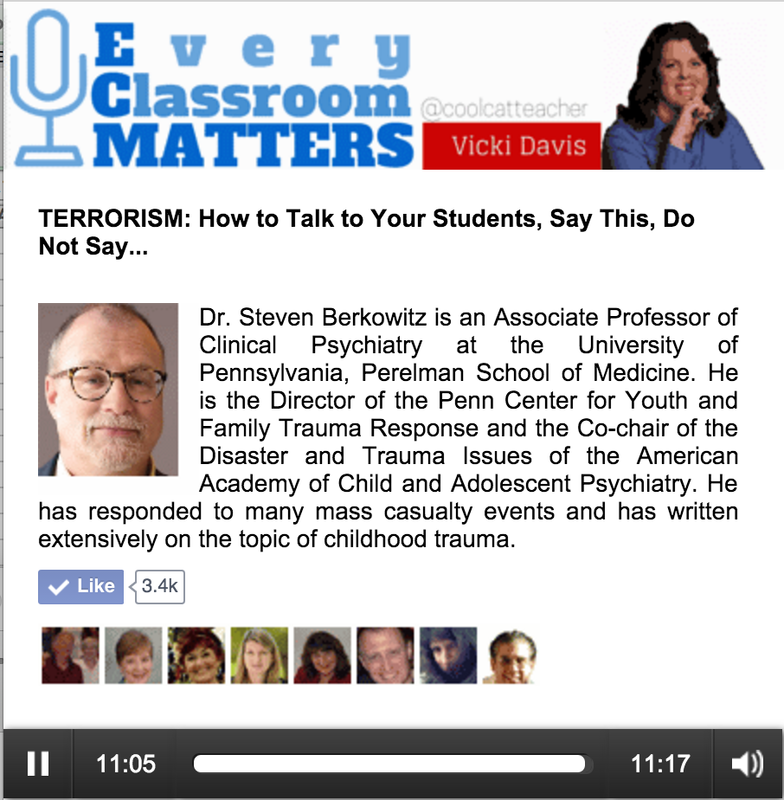 In this ever-changing world we need to consider how to talk with our students about terrorism. Not only must we deal with what is coming through the media, but we must also discuss with our students the possibility of that happening in our own schools. 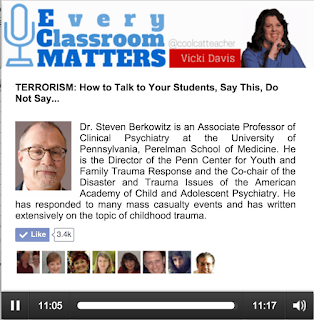 Recently, Vicki Davis (CoolCatTeacher) interviewed Dr. Steven Berkowitz at the University of Pennsylvania about how teachers can respond to this. Click here to listen to Vicki's 11-minute discussion about Terrorism. Is this your future classroom? Does this represent your future vision of Education? This is a student film festival award winner. It shows some great special effects and portrays some cool technological possibilities, but is this how you envision the classroom of the future? The teacher is still at the front and the students are following his/her lead. Is that what we want? The ISTE Global Collaboration PLN webinar that we presented tonight was a HUGE success. After Anne Mirtshin introduced us, David Stoloff and I began the webinar at 7:00 pm CST with a single member of the audience. The purpose of this webinar was to explore how Global Collaboration is and can be used in higher education. I provided the introduction and shared some of the experiences I have had in teaching students from around the world and having them collaborate with learners on the other side of the globe. Dr. Stoloff shared the many global collaboration projects that he has been doing over the years and provided an introduction to the Connecticut-Taiwan connection that he is presently doing with his undergraduate teacher education students. David has been working with a professor in Taiwan, Julie Chen. His intention was for them to to share their experiences as a team, but he has been unable to contact Julie for a couple of weeks and didn't plan on her joining him for the event. HOOORAY!!!! About half way through, Julie arrived in our ZoomRoom and they were able to share their experiences and discoveries. As the evening progressed, our audience increased and it was a great experience for all. Enjoy the recording of the presentation above and you can review the slideshows below. The website used for Dr. Chen's presentation is the dCCU-ECSU global connections website. Please contact us if you have any questions. 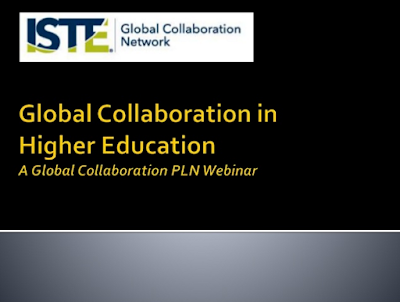 Join our exploration into the wonderful world of Global Collaboration in Higher Education. as they explore the present and future of Global Collaboration in Higher Education. Leigh Zeitz will serve as discussant to this project presentation. He will begin with an overview of global collaboration in higher education, explore the types of projects that might be completed as well as share some of his experiences with Global Collaboration across the globe. Julie Chen and David Stoloff will then discuss their on-going transcontinental project where 1st semester undergraduates are collaborating between Chinese Culture University (Taiwan) and Eastern Connecticut State University. They will share their successes and challenges as well as plans for the future. This presentation will use these resources eCCU-ECSU Global Connections. It includes a short video and a powerpoint presentation. Undergraduates at these two institutions will be encouraged to share their experiences following the presentation. Ample time will be reserved for an online discussion on expanding global collaboration for university classrooms. 0:16 - 0:45 Discussion of the Chinese Culture University - Eastern Connecticut State University Global Collaboration experience. 0:46 - 1:00 Questions about the Collaboration Experience and an opportunity for attendees to share their experiences. You will be asked to download a small program to run Zoom. After you have downloaded it, DON’T run Zoom. Return to your browser and go to http://tinyurl.com/z-zoomroom again. It will take you directly to our meeting room. World's Slowest Rube Goldberg Contraption - a REAL Learning Experience. Rube Goldberg Contraptions are defined as "a series of chain reactions designed to accomplish a simple task." These are incredibly fun and always include a good dose of mirth. Notice that there is nothing that says anything about the length of time this contraption will take to accomplish the task. I just found a video about the slowest and longest Goldberg contraption (Thank you, Marcy Seavey). This contraption involves all of the slowest materials that you can imagine. 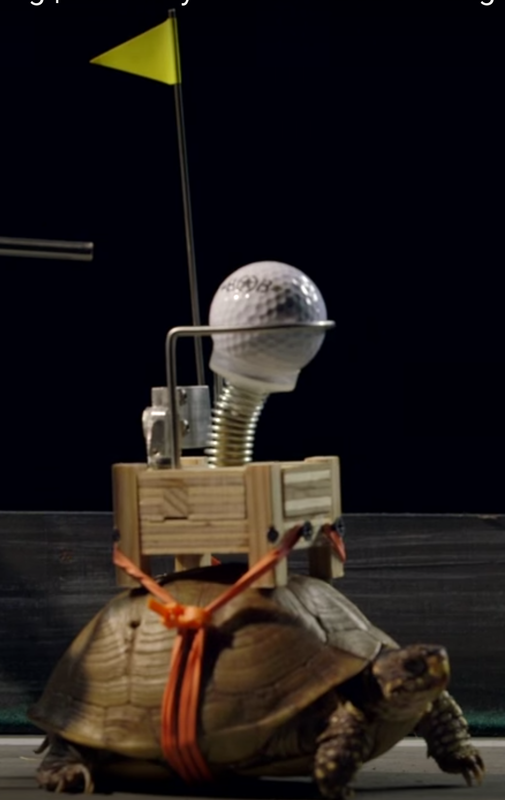 It involves a tortoise, a stream of molasses, melting popsicles, and even growing grass that pushes the golf ball along to its destination. Below I have included a video of this contraption running from beginning to end. No, it is not a 6-week YouTube video. It is carefully parsed and includes time-lapsed photography that takes you from the beginning to the end in 3 minutes. Wasn't that amazing? Below is a Behind the Scenes video of how Bob Partington conceptualized and created this sluggish invention. Wouldn't this be fun to do? What else would you include to create a slower contraption? 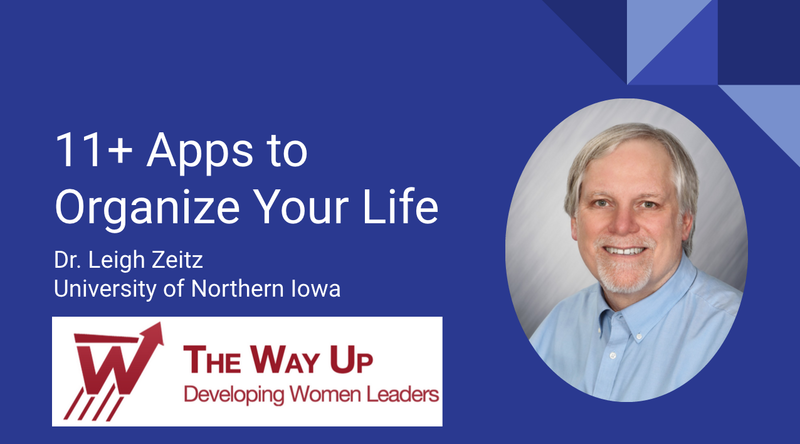 This fall I was invited to speak at The Way Up Conference 2015 in Des Moines, Iowa. This is an organization that is engaged in "Developing Women Leaders to Enhance Iowa Higher Education." I have spoken there twice before and it is quite an experience. First off, this conference is completely women. It is fascinating to listen to the woman's perspective on how things are happening in the world. It is enlightening to hear women discuss their experiences in leadership. Anyway, I was asked to share something about using technology to benefit professional lives. 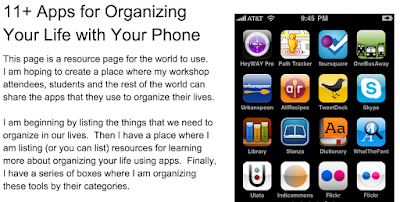 After I ruminated a little, I decided to share apps that they might find handy in organizing their lives. This proposal was accepted and I will be discussing it Thursday, November 6. This session will be replete with firsts. This will be the first time that I have spoken on using phone apps. I will be using Google Presenter for my slides - that's a first. I will be running sharing my phone on the screen and controlling everything from my phone - another first. Whether I will be directly connected or wifi connected to the projecting computer will depend upon how the wifi and other technologies are configured tomorrow. While I am going to be suggesting apps that they might find useful, I don't want it to be a show-and-tell. I want it to be more of a show-and-share. While I have been doing oodles of research on this presentation, I am by no means an expert on organizational apps. I plan to begin with sharing about what their phones can already do with Siri and/or Google Now. To begin with, there are definitely more than 11 apps. I used that number when I proposed it because I had no idea how many I would find. At last count, there were 34 apps to be discussed. For the sake of organization, I have identified 9 areas of organizational tools. I will be sharing suggested apps in each of these. As I explore each of these areas, I will share what I know and ask the attendees to share their favorites as well. The Question is "How can we capture all of these ideas for the future?" I have answered this ominous question with a Google Doc. 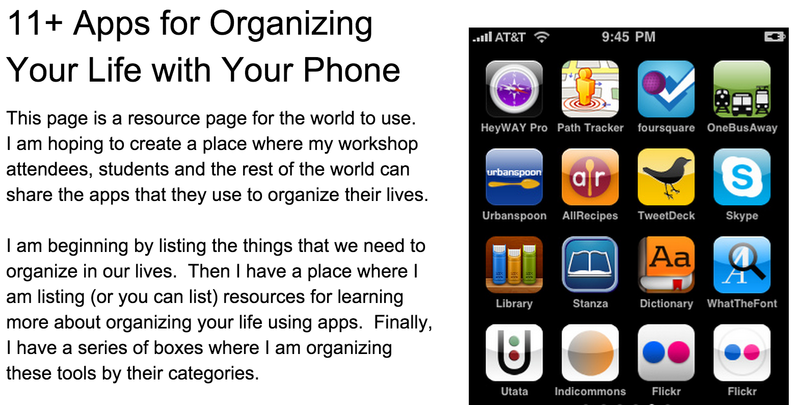 I have aptly named it 11+ Apps for Organizing Your Life with Your Phone. This document contains all of the apps and resources that I will be sharing. It will also be open for public editing so that the participants will be able to add their own suggestions or add the great ideas that they hear in the room from other people. This way, if any of the attendees want to follow up on these apps, the information is there for them to use. If you attended, please leave a comment about your opinion of the presentation. If you didn't attend, please visit the Resource Page to find, read about and add apps to the collection. Tell us what you did in a comment below. Innovation is what separates the winners from the losers - Steve Jobs. How do we foster innovative thinking in our students? Do it through invention. Today I have the opportunity to share my ideas and experiences with doing just that. I will work with educators at the Iowa Technology and Education Connection conference in Des Moines. It should be a rocking event. Here are some of the materials I used and the resources I have consulted for this presentation. Some of the materials I will be covering are also covered in previous Dr. Z Reflects postings so you will find some links at the bottom of this post. Videos - Shown before the presentation. Invent Tomorrow Links - List of the links I used sharing Rube Goldberg resources. Rube Goldberg Ideas video - List of videos that you can use to give your students ideas about the simple machines that create an invention. Video version of this lecture at K-12 Online Conference - This is a 20-minute version of this presentation that I submitted to the K-12 Online Conference. Nationalacademies - STEM Integration in K-12 Education - GREAT 4 minute video!! Rube Goldberg Inc. - The company that supports Rube Goldberg projects. Purdue University 2014 Rube Goldberg Winners - See how University students create "Complex Chain Reactions to Achieve Simple Tasks." 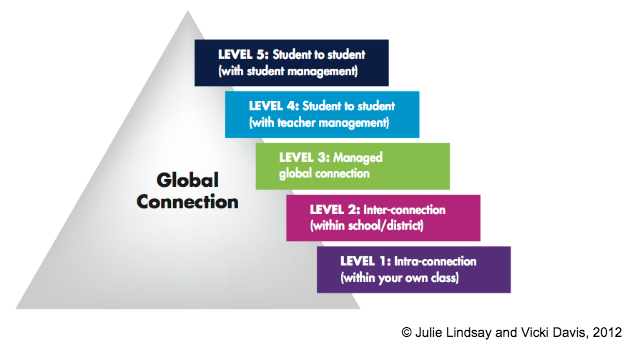 In their 2012 book, Flattening Classrooms, Engaging Minds: Move to Global Collaboration One Step at a Time, Julie Lindsay and Vicki Davis created a Taxonomy of Global Connection that shows a hierarchy of 5 different levels of online interaction. It begins with connecting students in a class using Web 2.0 tools and ends with students managing their own global connections with other learners across the world. Geographic Location: This strand begins within the classroom and then extends into the school/district and finally traverses the globe. Project Management: The second strand involves who is in control of the interactions. The bottom two levels are local interactions controlled by the classroom teacher. The middle level involves an online global collaborative experience that is managed by an external educator or group of educators. The top two levels involve student-to-student connections in an effort to achieve agreed upon goals. Level 4 is managed by teachers who manage, facilitate and monitor the project as well as managing the timeline. Level 5 uses teachers as facilitators but the students are actually running this peer-to-peer project. This is a fascinating way to look at global learning. How does it fit your collaborative projects or your idea of how global collaborative projects should be organized? How do we contact the educators in Iowa? We could email them, but we would need all of their email addresses. We could send them post cards, but that is costly. We could text them, but we would have to know their phone numbers. BUT WAIT! THAT'S NOT TRUE!! They would hear our short but important messages if they were following Iowa-Specific Twitter Hashtags. It's easy, it's quick and it segments specific sectors of people . . . It's PERFECT!!! The other day I was trying to find Iowa Education specific hashtags when I realized that I didn't have to do this alone. There are thousands of Twitter-using educators in Iowa who could help me. 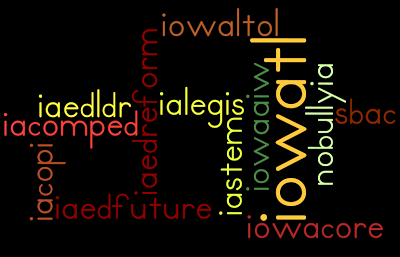 I created a Google Doc (editable by anyone with the link), Iowa Education Hashtags. I then created a tweet asking colleagues to help me create this collection of hashtags. I tweeted it a couple of times and the content began to grow. Presently, the list looks like the one that is below, but it is growing. 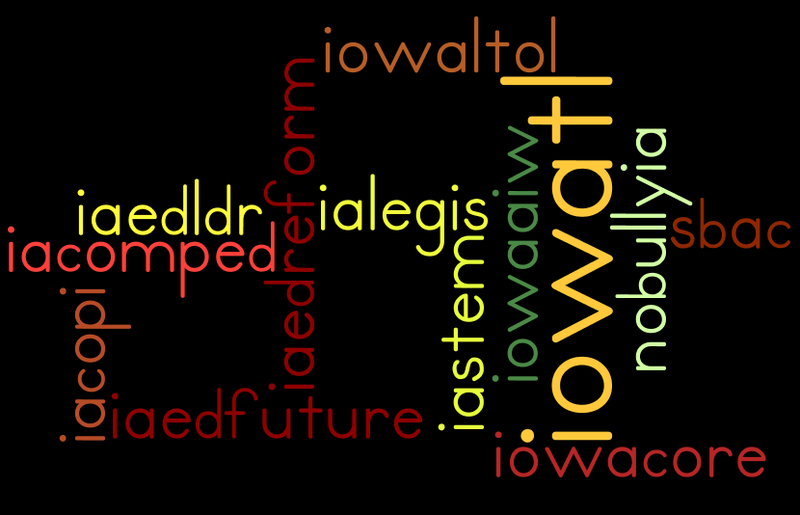 Please visit it, Iowa Education Hashtags, and add any that Iowa-specific Education Hashtags that you might know. Please include your name and the URL of a website that might be linked to the hashtag. ALERT: Here is a GREAT schedule of Education TweetChats across the country. It is created by CyberMan. He is an AMAZING educators who has catalogued everything. Can you add any hashtags? This is a wonderful 4-minute video by Linda Yollis and her 2nd/3rd grade students provides a realistic examination of how blogging in your classroom can turn writing projects into communication projects. Mrs. Yollis shares how she has used it to change how she is teaching and her students share what they are learning. I especially like how the students talk about how they rate their comments on other people's postings. They rate them using 1 or 2. The 1 comment responds to the posting but the 2 comment asks questions and continue with the discussion. I know that I will be using this in my Using Digital and Social Media class. What about you? Is it benefiting your blog use? Please respond with a 2-type comment below. I have the privilege sharing some ideas with about 80 educators at the Iowa Lakes Community College today. Should be an exciting time. This was originally organized as a lecture, but I have requested that everyone bring their own computers or smart phones or that the college supply laptops so that it will be a hands-on experience. My strategy is not to tell them about using technology to support learning but to actually have them take collaborative notes, share their discussions from group work, analyze data collected through a Google Form, Blog, video conference and even video capture with the new YouTube Capture app. Here is a list of resources used in the workshop. It is a collaborative notetaking document so much of the materials will have been added during the workshop. Inspirational Videos to Get You Ready to Start the New Year! we are set to blow the doors off! I was prepping for a class when a tweet crossed my screen that lead me to this inspirational video with Jeff Goldstein. They turned his words into a musical creation (how did they do that?) that is quite moving. A message from Jeff Goldstein about who teachers are and what is important. This is an inspiring video with a catchy tune. The GLOBE program provides this thank you to teachers like you. Have a WONDERFUL SCHOOL YEAR, EDUCATORS!!! You DO Make a Difference!!! 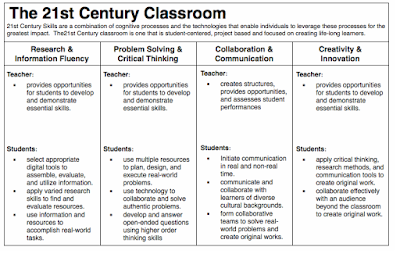 We have talked about the differences between 20th and 21st century classrooms, but here is a chart that describes the anatomy of a 21st century classroom. You will see that it is divided into the 4 C's of the Partnership for a 21st Century work suggests plus Research. You will also notice that this chart separates the roles of teachers versus students. What do you think? Does this do an admirable job of describing the anatomy or do you have something to add? 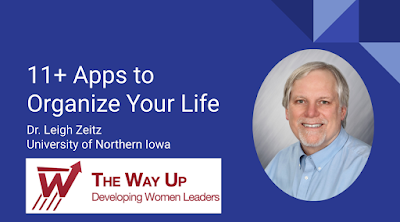 I have the wonderful opportunity to provide a few workshops at the Iowa Central Community College faculty conference called Tools for Teaching (T4T). I have two sets of workshops that I will be presenting. Dr. Z's Creative Cookbook for Collaborative Learning workshop - This is a workshop where we will be reviewing what it means to learn collaboratively and then explore tools and strategies for making it happen in the classroom. Google Apps in the Classroom workshop - This workshop will cover a variety of apps that we can use to improve the Learning and Teaching experience for Students and Teachers. It is difficult to identify the proper tools to introduce, because there is a wide and varying range of skill levels in this faculty. 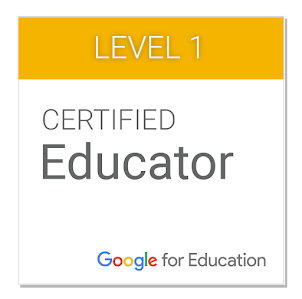 I hope that it will be a mind-blowing revelation for those who don't have much experience with Google Tools and an interesting mind-expanding experience for those who already use these tools with their students. Most importantly, I hope that I learn something from my attendees that I will be able to use in my future teaching. Here is the list of Resources used with the workshop. This is an open, interactive Google Doc so it will include information beyond what Dr. Z originally posted. I would love to receive your feedback in the comments below or share it using the icons below. 5 Unique Google Apps that You Haven't Seen . . . yet. It is amazing what Google is continually innovating. As if it is not enough for them to create revolutionary ways to organize, access and create data, they are constantly pushing the envelope with new inventions. You should review this WHOLE page before enjoying the videos to learn about what can happen in the World of Google. Dr. Z Has Gone Pink!!! You know, Angela Maiers says that when you engage in social media at least 30% of it should be personal. Including the personal part in your blog provides an opportunity for your readers to see who you are and what you do. Here It Is!!! Time for RAGBRAI!!! Every year I get together with 20,000 of my best friends who I haven't met yet and we ride our bikes across Iowa in a week. This is called RAGBRAI (Register's Annual Great Bike Ride Across Iowa). The route varies each year but it is a great way to see Iowa. This year the route is 462 miles. This is my 13th year. It is an annual extravaganza that is too exciting and fun for words. I find that riding RAGBRAI provides a great sense of accomplishment so that what I confront the rest of the year doesn't seem so daunting. I ride with Team Flamingo. I am Z-Bird. It is a great group of friends who train all spring to get ready for this trip. As you can tell, we really get into the Pink Flamingo thing. If you go to our website you will see some pretty scary pictures. I just wanted to tell you that life involves more than using technology to support learning. Life is filled with opportunities to do new things and confront new challenges and meet new people who interestingly become part of your life. Go out and do something CRAZY this week. Maybe I will see you on the RAGBRAI road. While I was at the ISTE conference in Philadelphia last month, I had the opportunity to meet with Bob Greenberg who recorded a few minutes of me talking about how we might integrate this into our classrooms. 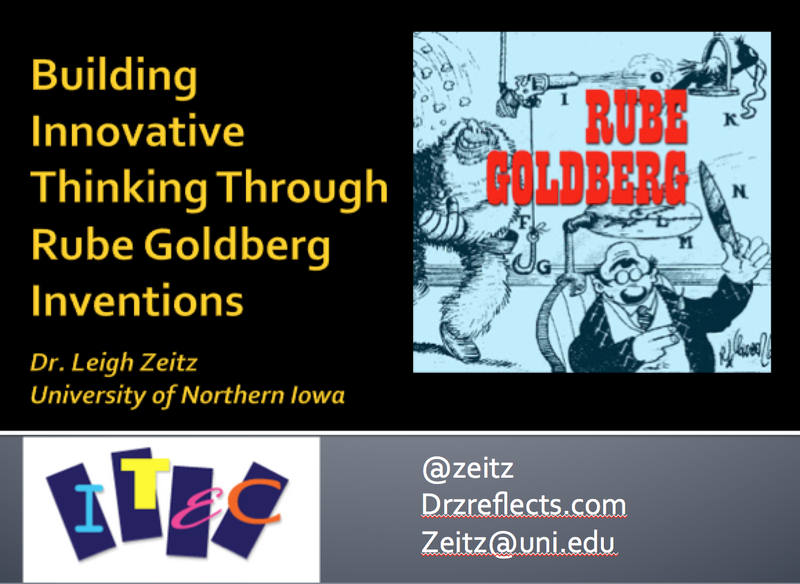 This is the basis for the presentation I shared at ISTE on using Rube Goldberg in the Classroom to teach STEM with our students. Bob Greenberg has been recording a number of education leaders for his Brainwaves Video Anthology. These recordings include discussions with leaders in education like Alan Kay, Sir Ken Robinson, David Jakes, Vicki Davis, Julie Lindsey, Yong Zhao, Noam Chomsky, Robert Sternberg, Nicholas Negroponte, Tony Wagner, Linda Darling-Hammond - The liste is endless. Watch a couple of these videos and share them with your friends. Share in our comments what you learned while watching them discuss their ideas. Theser are some great tips for keeping up. It was created by @sylviaduckworth The main message is "Don't try to keep up with it all and build your networks of colleagues to help you keep learning." Do you have any tips that you would add to this? Please leave them in the comments section. Based upon the discussion at the end of our ISTE session, I have created a Google Doc where you can add your ideas and examples about how to engage Rube Goldberg problems in learning. Just click here to jump to the Rube Goldberg Community page. How do we teach STEM using exciting and crazy devices like Rube Goldberg Inventions? Today I have the opportunity to share my ideas and experiences with doing just that. I will begin by introducing the facets of STEM education along with 8 essential elements for Problem-Based Learning which is the basis of effective STEM education. I was just reading Cool Cat Teacher when I saw this posting. 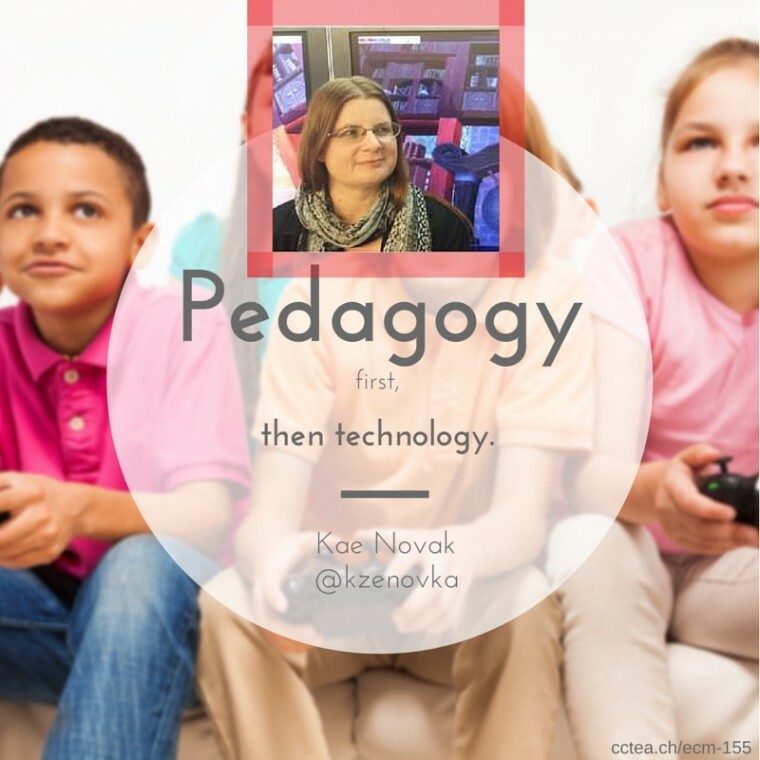 It is an interesting topic but it was more interesting when I realized that I spent the last couple of days with the author, Kae Novak, here at ISTE. She really knows gaming and I am learning a great deal as I work with the ISTE Gamers. I will be movinging forward with introducing gaming into my fall classes and I am learning A LOT. Pedagogical Tips on Gaming Successfully in the Classroom. Understand what makes a good game. Connect with other teachers using games. Consider how games can teach more. You should go the the full posting at Cool Cat Teacher to read the rest of the discussion. 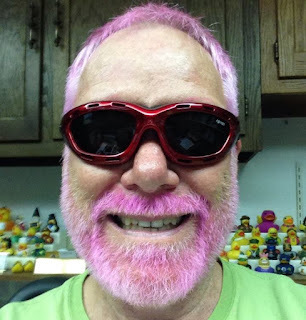 I am going to the TIC conference in Dubuque this coming week and the ISTE conference in Philly next week. I have been attending Educational Technology conferences for over 2 decades and have always loved going there. I learn a lot from the sessions and I get to connect with friends that I have developed over the years. This morning I read an article in Forbes by Jordan Shapiro. This article, 4 Fundamental Problems with Everything You Hear About the Future of Education, included some insightful comments that I would like to share with you here. Below, I have listed the 4 myths that Shapiro enumerated along with some of my own narrative. I strongly suggest that you read the whole article connected to the link above to get the full flavor of the message. 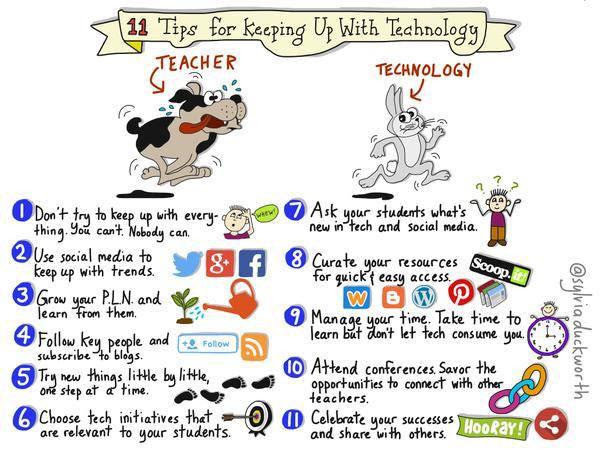 Kids are bored and technology will provide better ways to engage students. - I agree with Shapiro when he says that it is about the teacher, not the technology. 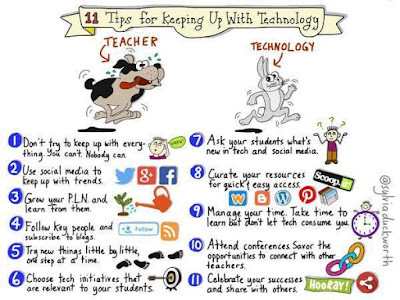 Unfortunately, the biggest barrier I have with the future teachers that I teach is that many of them have the belief that we need to integrate technology for technology's sake. Not the case. Technology can provide opportunities for learning that would not be otherwise available but it can still be used badly. We can use video conferencing to connect 6th grade classrooms in different countries but if their activities are limited to teacher-led worksheet filling-out, there is little value. More data-based adaptive technologies will lead to child-centered curricula. - Intelligent tutorials are useful devices in building skills, but they aren't the answer to building child-centered curricula. If you have a skillset that your students need to learn, it has been shown that students can learn faster using adaptive technologies. BUT the key is how these skills will be applied. This can't be done using data-based adaptive technologies. Problem-based learning can provide the valuable learning experience that students can have when applying those skills. Video games will finally contextualize academic content - Video games can present problems in a context but does that necessarily align with the real world? When learners play "against the machine", they learn in the the context that the programmers provided. When learners play against each other in a game like Civilization, they are provided a context within which they are working with other people. The game provides the playing field and the contestants provide the human emotions and decision-making processes from which they will learn. Experiencing the actual decision-making process that a person will undergo when negotiating a treaty or deciding about attacking a fortress can provide insight that couldn't be learned from a book. When students have these experiences together, they can come to class and discuss their feelings and learn more about what historical figures might have done. Learning should be more fun. - Shapiro points out that learning is NOT fun. Learning is an experience where you are stretched. It is a situation where you are drawn from your comfort zone and expected to succeed. Can this happen in games? - Yes. Is this necessarily fun? - No. It is challenging. Being challenged and having a safety net so that you can try new things without the chance for a huge loss can provide a sense of accomplishment but it doesn't need to be fun. While you can see that Shapiro and I don't see eye-to-eye on everything, you should read his article. It has a lot of good points in it. 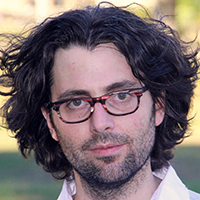 I just downloaded the .pdf of his book, The Mindshift Guide to Digital Games and Learning. I haven't read it yet, but look forward to experiencing his advice. What do you think about these points? Please provide a third-leg to our discussion. 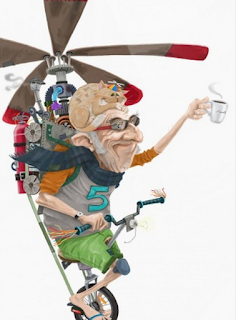 Are YOU a Helicopter Professor/Teacher? What do you do when you decide to move from "Sage on the Stage" to "Guide on the Side?" Typically, you spend a GREAT deal of time setting things up so that you can create a learning environment where students learn by researching and doing new ideas instead of listening to you telling them these ideas. A part of being a Guide on the Side is that you may feel like a 3rd wheel while you watch your students work together in class. It's ironic that the best way for your students to learn can be to learn on their own with you "out of the loop." You may not be directly involved in their learning experience, but you are guiding them through the learning process. You are taking a different role in the classroom. I just read an article in Faculty Focus where Berlin Fang is suggesting ideas that will provide your students with the "proper balance of challenge and support." Dr. Fang introduces some interesting concepts in these 6 suggestions. He discusses Free-Range Assignments that are individualized competency-based challenges. He suggests that we should help students but don't teach helplessness. This sense of self-efficacy is accomplished by starting with scaffolds to support new learners, but methodically removing them so that students can learn to stand on their own. What do YOU think? Did that article hit the button with you or are you still a Helicopter Educator? Here are some quality tips on how to write quality comments on a blog that you just read. I learned a lot. Maybe this will be useful for you and your students. Yes, I know that this is different than the typical discussion on Dr. Z Reflects, but I just had to share this wonderful science experiment. This 5-minute video shares a wonderful demonstration of applied mathematics and science. Using a tray full of peeps, you can actually demonstrate how wavelengths move across a microwave. The experimenter (couldn't find his name in the credits) places a tray of marshmallow peeps into a microwave and turns it on for a couple of minutes. He pulls it out and then looks for the specific places where the peeps have really melted. These places are about 2.4 inches apart. Based upon the assumption that the microwaves are melting the peeps in places where the wave actually travels through the peeps, it is possible to use these calculations to compute the speed of light. I can see 10 year old students doing this and suddenly having a realization light going off in their heads by this demonstration. This is a MUST WATCH video and MUST IMPLEMENT in your classroom. 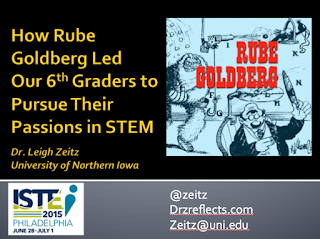 What do Rube Goldberg, STEM and Literacy have in common? That's a good question. I have been invited to share our Rube Goldberg experiences as a Featured Speaker at the UNI Elementary Literacy Conference. Interestingly enough, I will be sharing the stage with Dr. Beth Van Meeteren (STEM in PreK-3rd Grades: A Reason to Develop Literacy); Marcy Seavey (Finding the Citizen Scientist in Every Child); and Rick Vanderwall (Media and Drama Integration with Literacy) It will be an exciting opportunity for all. 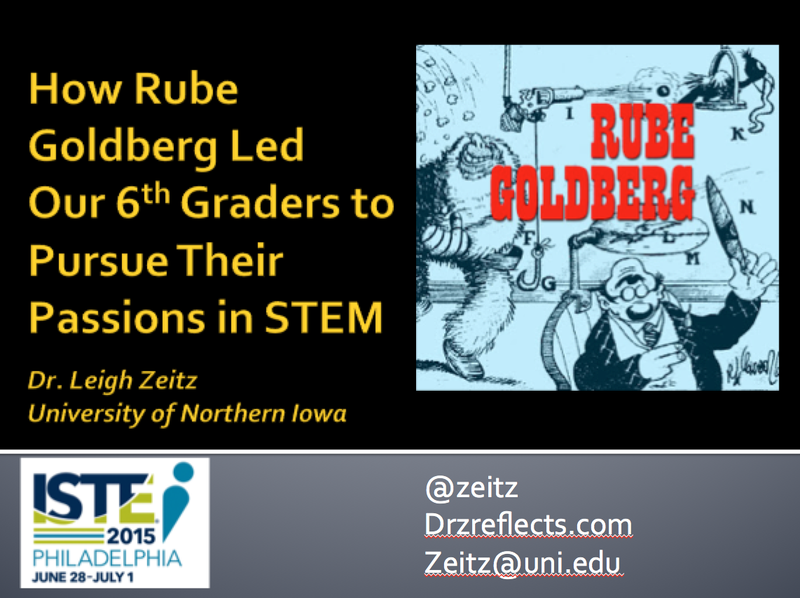 Today I will be sharing our Rube Goldberg experiences in the 6th Grade Waverly-Shell Rock Middle School. We will discuss the explorational process that we experienced while creating our own inventions to accomplish simple tasks. These tasks might be turning off a light, erasing a blackboard, or popping a balloon. These may seem like meaningless tasks, but its not about turning out a light. The emphasis of this process is the creative problem solving that our students experienced while they were building these inventions. If you want to learn more about my presentation, you can refer to my other posts in DrZReflects. The Slide Show is available in the list below as well as some of the other resources that I used in preparation. Do you have more resources you want to share? Please add them to the comments below. Project-Based Learning is not an easy way to teach but it is much more rewarding for the learners and the teachers. Here are some must-watch videos about Developing Project-Based Learning. I have tried to share them in a progressive sequence that you can use to move through the process of learning about and through PBL. Looking for an easy introduction to PBL? This Common Craft video developed for the Buck Institute for Education does a good job of describing PBL and how it fits into 21st Century Curriculum. 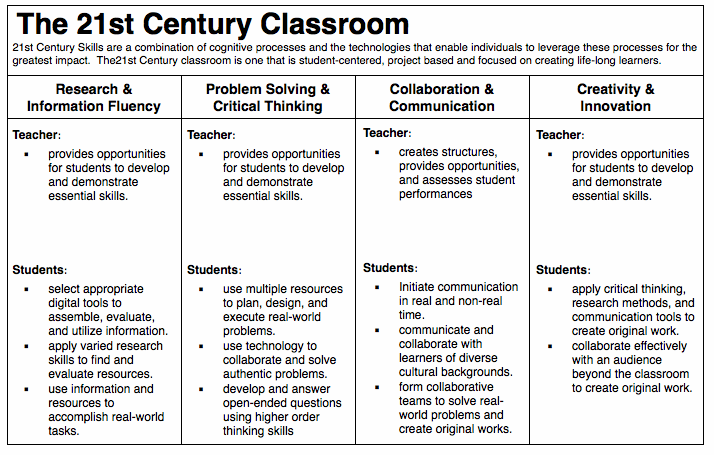 An interesting part is that they only talk about 3 of the 4 Cs (Communication, Collaboration and Critical Thinking). I wonder what they did with the fourth C, Creativity? Well-designed PBL has been shown to result in deeper learning and more engaged, self-directed learners. This video provides a suggestion for five core elements of successful PBL. Here are more resources at Edutopia where you can learn more about PBL. Introducing PBL into your class isn't an easy process. This video shares the difficulties and triumphs of Sammamish High School (Washington) teachers as they move from traditional teaching to schoolwide problem-based learning. This 30-minute webinar explores how PBL might be assessed with the BIE Editor-in-Chief, John Larmer, and a team of educators. Project-Based Learning is the epitome of 21st Century Learning. How are you using it? What additional resources do you need to make it a reality in your teaching?